It isn't often we can get a wine of this pedigree at this price. After all, it is made by the people at Chateau Lafite Rothschild, one of the most famous names in the world, and not just wine. Lafite is in the village of Pauillac, where three of the five first-growth Bordeaux are crafted. It is considered the finest village in the finest appellation in the world. What is interesting here is that this 2016 Legende Bordeaux has a simple Bordeaux appellation. Just the word Pauillac would add $50 to the price tag. Bordeaux is a huge area and there are a lot of wines that are simply labelled as such. However, when the chateau doing the labeling is Lafite, everything changes. All of a sudden, this is not just Bordeaux, and for good reason. These people have a reputation to uphold as well as the responsibility to do so. And they do so very well. They only know how to make wine one way and, regardless of where the grapes come from, the process here is as meticulous as it is for Lafite. 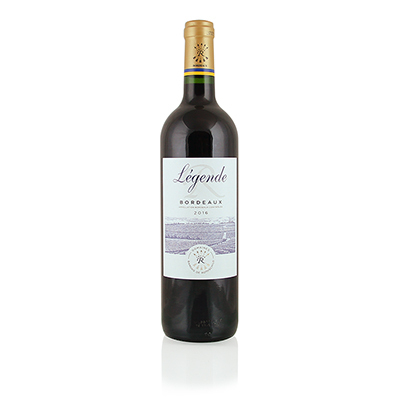 You can taste it in each glass of this 2016 Legende Bordeaux. The yields are held to a minimum. The grapes are hand-picked and sorted so that only the best of the lot are used for each bottle of Chateau Lafite Rothschild Bordeaux. The wine is finished with slow fermentation and oak aging. Every step of the process is monitored and controlled so that the result will be worthy of the name. From the raspberry notes in the nose, to the vanilla and berry flavors on the palate to a finish with tannins like silk, this wine is the perfect example of Chateau Lafite Rothschild Bordeaux. And one that proudly upholds the Lafite Rothschild reputation.